Sometimes your life is split by a single decision. I’ve spent every day of the last seven years regretting mine: he left, and I didn’t follow. A thousand letters went unanswered, my words like petals in the wind, spinning away into nothing, taking me with them. But now he’s back.I barely recognize the man he’s become, but I can still see a glimmer of the boy who asked me to be his forever, the boy I walked away from when I was young and afraid. Maybe if he’d come home under better circumstances, he could speak to me without anger in his voice. Maybe if I’d said yes all those years ago, he’d look at me without the weight of rejection in his eyes. Maybe if things were different, we would have had a chance. One regretted decision sent him away. One painful journey brought him back to me. I only wish I could keep him. 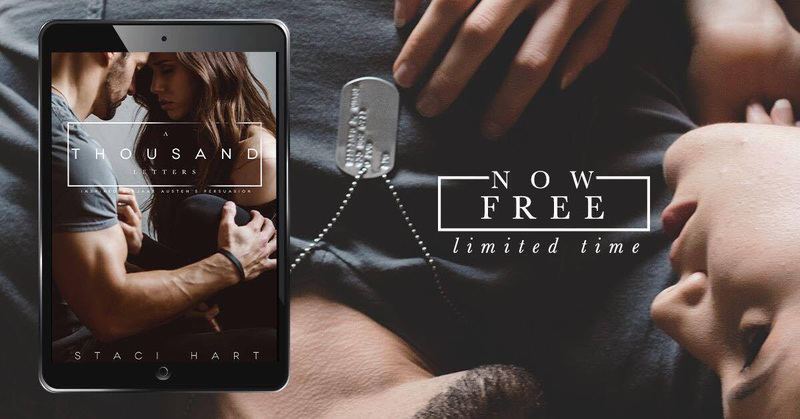 A Thousand Letters by Staci Hart is FREE for a limited time only! My lack of words for this book is astonishing. I still after over twelve hours feel emotional about this book on so many levels. This is an intense read, an emotional read. A read that will stay with me for a very long time. A thousand letters is that kind of book. A book that is heartfelt, that breaks you, that puts the little pieces back together in a manner you thought isn’t possible but you love it all the more for what it has made you see, made you feel, made you take on board. A sententious read with layers that go so deep and there are so many that it is a lot to take all in at one moment. That makes you want to go back and reread the book straight away to work through all of the emotions that hit you all at once. To pick them apart and to feel the impact that it has on you. This is a deeply emotional read for me. Every time I thought they find back to one another something came up. Ms. Hart’s writing is flawless. She delivers a story of love lost, that one love and over second chances. Her brilliance and cunning to use literature to underline all the emotions that are brought to the forefront is undeniable beautiful. It gives the book additional depth not that it needed it to begin with. But it just makes it to be more. It has an old soul feel to it. Lyrical and poetic at the same time. I love it. It is a pleasure to read. Exceptional words with exceptional beauty by the author. And I found myself in the dark, found her in the dark. I found the light and truth in darkness, hiding there were I couldn’t see, right in front of me the whole time. Today the sun shone. Today, I saw him, saw the tenderness I’d longed for, dreamt of. Today, tonight, was magic. Elliott & Wade are meant to be together. They are were meant to be together seven years ago. They are meant to be now and they are each other’s forever. A split second of uncertainty a choice can take everything from you and impact you for the rest of your life. I was never able to let him go. Didn’t matter that I knew nothing. The boy who I walked away from lived on in the wreckage of my heart, and I never stopped wishing things had been different. A tragedy brings Wade home and brings them back together. Trying to align the new reality to what happened in the past is difficult for both Elliott and Wade. To truly understand what happened and to if they have a chance they have to be honest, lay it all out. Be naked take what the other person is to say. There is so much pain, grief and hurt between them. They dance that goes back and forth between them. There is so much begging, pleading, anger, disappointment. But dishonesty to the real reason. They blame each other but time just wasn’t on their side. They were young, so very young that the cruelness, the despair and lack of understanding, the inequity to understand what is happening the wisdom to go back and change it. To say sorry and that you’d made a mistake, swallowing pride and then convincing yourself that it is better this way that way the hurt, the pain and the suffering couldn’t get much worse. Although they aren’t the same people they used to be that connection that depth of love they have for one another is still there. There were times where I thought they wouldn’t make it. They gradually who they are meant to be. Together. The first book I read by this author I couldn’t get into. The second book I stopped reading as I didn’t like the theme of the book. But this book….. Third luck is a charm Ms. Hart. Anyone can do Pride & Prejudice and so many have. But Persuasion? Utterly unique. Without a shadow of a doubt I would recommend this book to everyone. The year is still young but this is one of my favourites so far.